LiberCloud, the learning management and collaboration platform for educators and trainers, announces integration with Microsoft Office Online to give increased flexibility to deliver instruction materials via interactive slideshows in Microsoft PowerPoint. 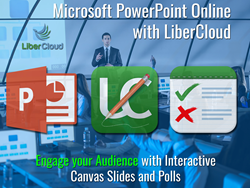 LiberCloud, the cloud-based learning management system for instructors, trainers and educators, announces integration with Microsoft Office Online to better enable Microsoft PowerPoint slideshows as a delivery method for blended learning materials and to give the ability to incorporate existing PowerPoint content in new ways. Microsoft Corp. is making this possible with their Cloud Storage Partner Program, which enables cloud solution partners, such as LiberCloud, to create seamless integration with Office Online. LiberCloud's existing learning content management solutions combine the best of instructor-led engagement, blended learning, and interactivity between instructors and students. This new release makes its platform even more flexible via seamless integration with PowerPoint Online so that users can create and store PowerPoint content directly within their existing LiberCloud authoring tools. LiberCloud® helps learning organizations break free from the constraints of traditional learning and training technology with a platform that provides a powerful way for training authors and instructors to collaboratively create and deliver engaging blended learning content.